Life’s Choices, Experience, and Recent Directions. One of my ancestors, a great uncle, worked in Kansas City as a sign painter many years ago. He had a productive career, a good family life, enjoyed his retirement and passed away at an old age. What more could you want out of life? But I have always been intrigued by a career choice he didn’t take. My uncle was asked by a co-worker to come work in a new business drawing cartoons but with a family to support he felt it was too risky. The co-worker, a young Walt Disney, was just beginning to follow his dreams. I have always been interested in designing, inventing, and creating things. That’s one of the reasons I started programming computers. I liked art and drawing but thought trying to make a living as an artist would be too risky. Instead, I started working as a drafter and enjoyed the creativity while working with engineers. Eventually I got to bring my interests together by writing programs for Computer Aided Design and Drafting (CAD) systems. My CAD niche market lasted over twenty years until clients began going out of business due to market changes and other potential clients turned toward outsourcing overseas. I’ve experienced the hardships caused by the loss of jobs and that sense of identity once derived from my career. Now, thousands of people are loosing their livelihood as corporations claimed to be too big to fail are failing and we worry what other cornerstones of enterprise will be taken down with them. “Publish or Perish”, “Innovate or Die” are more than just slogans, they reflect modern reality as we shift into a new world economy. On-line communities are a vital lifeline I’ve used for research and re-inventing my career to expand into robotics and automation. Publishing ideas, inventions, and creations has never been easier and getting attention is becoming easier through the use of social media techniques. Local communities also play an important role. I’m the founder of Make: KC in Kansas City. As Make:KC and the Fab Lab grows, it will help to enable creativity and provide a place to physically build prototypes and inventions. Our greatest resource for the future comes from our ability to innovate so we can take a great idea then jump start or restart our careers. The nice thing about having a motorhome is that it doesn’t matter where you are around the country it feels like you are always home. You always have your own bedroom, kitchen, bath, and living area with you. 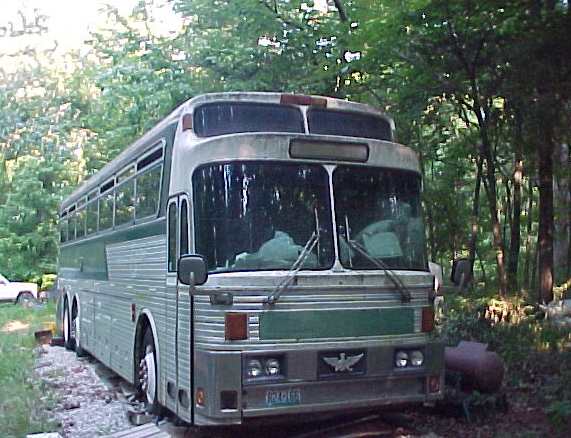 My wife and I have lived in this bus for a couple of years but it has been sitting vacant over the last three years. Any time you are remodeling or building a house and trying to live in it at the same time it is difficult. The smaller size of a bus makes it increasingly difficult to finish the interior while living there too. A few details about the area. 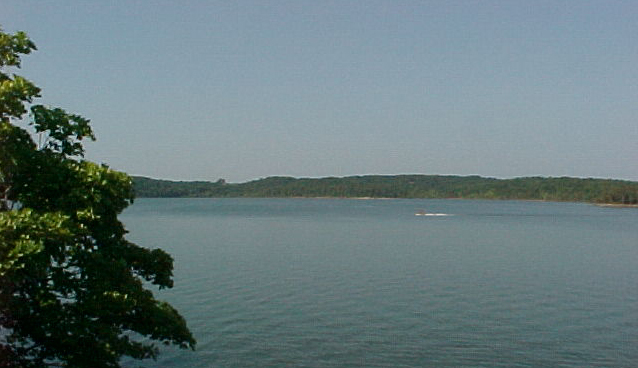 Our property is adjoining a beautiful clear water lake most noted for fishing and sailboats. Although today the wind is calm making it hotter on the hill to work around the bus. 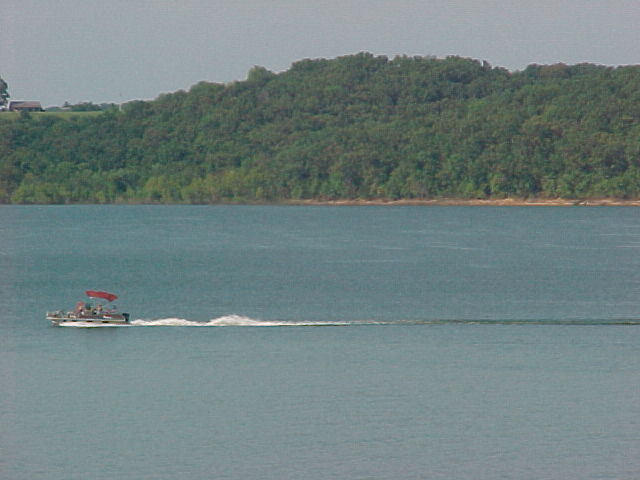 These lake views are shot across the lake toward our place on the hill. The temperatures have been in the upper 90’s this week making it difficult to get much work done on the bus. Night time temperatures inside the bus have dropped down to 96 degrees making sleeping inside difficult too. 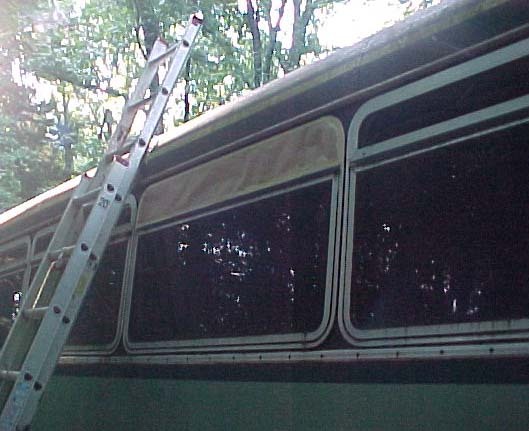 One of my first projects is to fabricate window screens so I can leave the bus windows open without letting insects inside. I have started making a template of the window’s shape for my new window screens. Spider webs, ticks and critters. I made it down to our property. 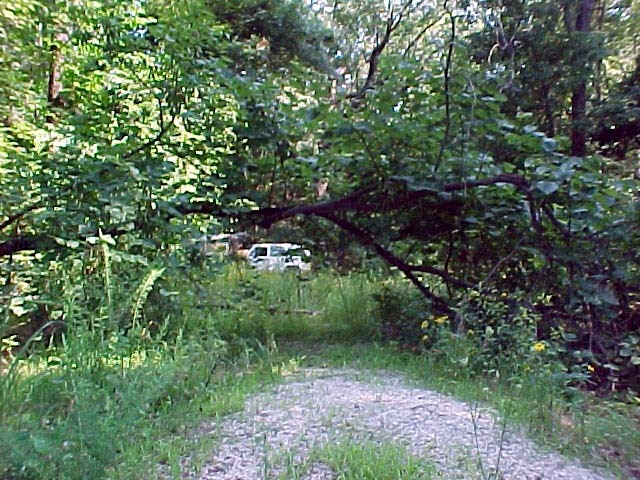 There is a tree down in our driveway but the nice thing about having a jeep is it can go around and over things a normal car can’t. 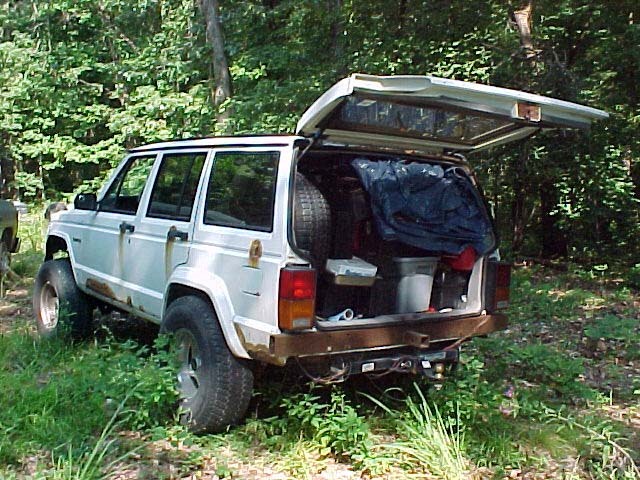 The jeep was packed so full that I couldn’t get much anything else in here. I’m making my way through all the spider webs. The two things that seem to grow well on this property are trees and tics. We haven’t been around for so long I’m hoping that some other critters haven’t decided to make their home in the bus. 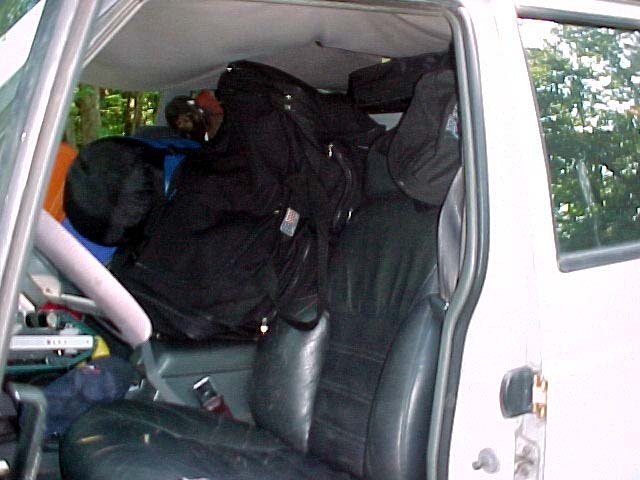 Packed from front to back. One good thing about being down here. The gas is 40 to 50 cents cheaper than Kansas City. The prices here are $3.36 today. I brought my tools that are important to the work I’m doing on developing educational robotics workshops. Not that a band saw, drill press or routher are going to be much help for a while. We don’t have electricity here any more and no phone service to get on the internet. tonight. It was 100 degrees inside the bus this afternoon. With so many trees around it doesn’t let much of a breeze come through. I’m in town now at the lundromat to get some bedding washed up. Its been over three years since we were living in the bus full time. Kind of feels nice to get back here. Will try to find wifi access when I get done here. I learned that there is a new comunity grocery store in nearby Fair Play. They opened up earlier this year. They are closed on Sundays. That will be quite convenient. I am now officially unemployed. For the last few years I’ve been under-employed getting some part-time projects and odd jobs. I developed and presented a series of robotics summer camp workshops for kids which ended last week. I don’t have any other work lined up yet. A problem about having a specialty in software development is when companies decide its better to send the work overseas. I have specialized in developing custom applications upon Bentley MicroStation for over 20 years, mostly working for companies that sold MicroStation through their dealer network until Bentley put them out of business. Then I tried contacting Bentley about doing contract work for them but was told they develop some proof-of-concept programs locally but ultimately send the custom work to India. So much for paying to be in their developer network. Well today I’m packing my tools to head back to my place on the lake. Another dream that came to a halt with the downturn of work. I’ll write more about that soon. I designed a bumper sticker recently but haven’t printed it yet.